"When once you have tasted flight, you will forever walk the earth with your eyes turned skyward, for there you have been, and there you will always long to return." -- Leonardo da Vinci. This was a surprising statement to be made in the fifteenth century, when most of the worlds population was too busy trying to stay alive to think many profound thoughts. But given da Vinci's genius, it isn't surprising that he said this for flight has always fascinated man. I would imagine that down through time many humans have such feelings, but not the ability to put them into such eloquent words. Socrates came close, almost five hundred years before Christ, when he said "Man must rise above the Earth-to the top of the atmosphere and beyond-for only thus will he fully understand the world in which he lives." For those of us who fly our own aircraft it's not surprising that a yearning for the sky is in our DNA, and we scratch that itch each time we leave the earth. But for some of us the desire to fly like the very birds that inspired ancient man's longing, trumps flight in a conventional aircraft. Many years ago I first witnessed paragliders while traveling by train through Austria. Parachute-like inflatable wings with tiny humans hanging beneath, wheeled and soared over the valley that my train was traveling through. The memory is still fresh in my mind after all these years, the bright slashes of nylon against a cerulean sky, the whole scene framed by snow capped Alps. When I returned home to West Virginia I searched, in those non web days, for a place near me that I could learn to do this. California had a couple of paragliding schools, but it wasn't in the cards for me at that time, to travel so far and take the time from work that it would require. Paragliding took a back seat in my mind. In the meantime, during one trip to North Carolina, my daughter Stephanie and I each tasted the sand of Kitty Hawk while trying out hang gliding at the dunes. While the feeling of lift was exhilarating when it occurred as we charged headlong down the dune, but our toes were never more than six feet from the sand and the flight never lasted more than a few seconds. Somehow the whole experience seemed to pale during the struggle back up the steep dune lugging the awkward frame of the glider. I was left with the thought that hang gliding wasn't for me. About ten years later I sold a Cessna 414 to a buyer from Chicago and during the course of the sale and getting him checked out in the airplane, he mentioned that he was a paragliding instructor. I probed him about what it was like and his reply was that I would no doubt like it enough that I would probably neglect other things for it. When I recalled my hang gliding experience I asked how long it was possible to stay up. "If conditions are right, you'll only have to come down to use the bathroom" he replied. So inspired once again, I renewed my search for a school near me. Finally, I found an instructor that lived deep in the mountains of West Virginia, in a tiny hamlet of 900 souls called Webster Springs. An unlikely place for such a sport I thought, but I gave him a call. 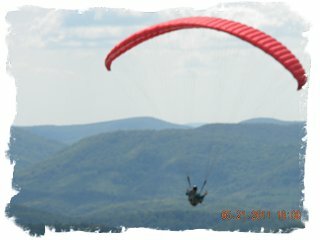 In a very laconic way which I later found defined him, Dwayne McCourt admitted he did teach paragliding. If I wanted to come down and talk with him, he said, he'd probably teach me to do do it if I wanted. I made an appointment. It was high summer when I made the trip down to Webster Springs. The two lane blacktop road twisted between forested green hills that showed little evidence of human habitation except for the occasional dwelling or house trailer. West Virginia summertime was in the air, as much a feeling as a scent. It was a humid life cycle making itself known, where death was not completely camouflaged by the bursting celebration of leaf and bud, and it mingled with the scent of grass and damp earth, of decay and unchecked vegetation to form a feeling in me of hope and despair all at once. Driving down the steep grade into the sleepy little town always gave me the feeling of descending into a giant hole. The small, deep valley, surrounded by brooding mountains bespoke solitude, which was there in spades, since the interstates and much of modern life had passed it by a long time ago. If you found yourself there it was because that was your destination. A traveler would never pass through this town on his way to somewhere else. A century ago though, it was the bustling center of the thriving West Virginia lumber industry. The business of the mills, the five hot springs and the grand hotel that was there until it burned to the ground, drew visitors and industrialists from the north, some of them well known. A local mountaineer named Rimfire Hamrick became a favorite hunting guide for such folks, and was famous for asking John D Rockefeller, when introduced to him and told he had come all the way from New York, "How do you stand to live so far away?" I mention Rimfire only because in Dwayne I found the modern Webster Springs equivalent of that ancient's independent and Mountain-bred eccentricity. Dwayne, self effacing and quiet to the point of taciturnity, lived in that tiny hamlet with his pretty wife in a modern and very nice house by the side of the road leading into town. 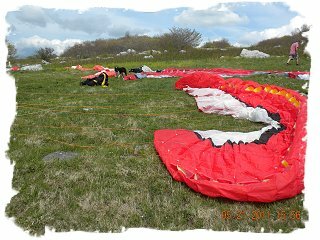 I learned that he had traveled the country to learn paragliding and earn his instructors rating, then continued to travel and teach the sport. He was also a fixed wing pilot and owned a couple of airplanes. I also learned that I actually had spoken with him in the past, when he had called about airplanes that I was selling. After getting acquainted a bit, Dwayne poked about his house gathering equipment, bundled it up his in his arms and led me to the top of a small hill behind his house. He strapped the chute on me, slowly explaining various parts of it to me in his laconic way. He spread the chute on the ground behind me and faced me down the hill. The idea he said, was to run forward holding risers above my head and let the chute fill. It would then rise and become horizontal above my head. I was to keep charging as fast as I could down the hill, until the chute lifted me. As I became airborne, I was to straighten my legs and slide back into the built in cradle which served as a seat, effectively retracting my gear. On landing I was to slide forward, extending my legs in the landing position. Much to my delight, it worked just as promised, and I made several small flights from the little hill that day. None of them long or very high, but the lift was there and I could feel the potential that waited on a bigger hill. A week or so later I got a call from Dwayne asking me if I was ready to fly. He was going to be at his Piffer Mountain base on Saturday, he said. I knew that Piffer was part of the Appalachian chain which was located just to the east of my home and that it was the real deal, not a foothill. In his opinion, he said, I was good to go off the mountain, and if I thought so too, I could meet him there. I wasn't sure at all, but I was sure I'd be there. That Saturday I stood dazedly staring up at the mountain looming above us. It stretched up and up, 3500 feet of green, framing a perfect day. The summer Breeze was hardly moving the leaves on the trees. Dwayne pointed to a band of trees near the summit as the place where the chutes could first be seen. In less than a minute one appeared, ghosting into view above the forest, it's tiny human hanging below like a fly in a spider web. My thoughts at that moment could be loosely summed up as, 'gulp'. After torturous trip in Dwayne's car up the goat path that served as a road to the top of the peak, we joined the twenty of so enthusiasts attracted by the weekend of promising flying weather. The launch area at the very top, was a rounded meadow with the mountain falling away rapidly and descending to the band of forest that I had seen from below. The landing area where I had stood was hidden from view and it looked as if the departing gliders were bound for a tree landing. After watching several takeoffs though, I saw that the lift of the chute ensured plenty of space over the forest and some of the departures were gaining altitude as they circled in the updrafts. Strapped up and procedures reviewed with Dwayne, it was my turn to leave the mountain. 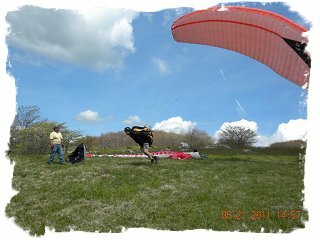 I ran down the slope and felt the chute billow and lift to overhead. The drag was tremendous and as I felt I couldn't run further, my feet left the grass and I was airborne. I settled back in the seat of the harness. I was flying. I was flying and it felt completely natural, not unlike flying a very slow airplane. The forward speed of the chute through the air was just over twenty miles per hour, and as I sailed over the wooded area I felt the nibble of a thermal. I tentatively pulled on the left spoiler line and the chute obediently began a slow turn in that direction. The nibble I felt became a bite as I flew back into the effects of thermal and I began to rise, up and up, still circling, until I was looking down on the launching area that I had just departed. Higher and higher I circled until the 2-way radio that Dwayne had strapped to me crackled. "I didn't think you'd go soaring, so I hadn't told you about the safety parachute yet" his slow drawl came. His belated briefing came via the radio, 'should the need arise', as I continued circling. My first flight lasted over half an hour and took me so high in the thermal that I started to get chilly. The landing in the valley below was good as I dodged the very large boulders that peppered the landing zone, where a volunteer held a portable windsock. I was down. I had done it. I had at last, after all these years, flown like a bird. Copyright © 1997 - 2016 Steve Weaver Aircraft Sales. Specifications are based upon owner's representations, and subject to buyer's verification. Aircraft are subject to prior sale or removal from market.